At my daughter's request, I signed on to work on the Carolina Crown food truck for a week last summer. I didn't have a clue what it was all about, but the more experienced volunteers just took me in and made me a part of the team. It was long days and hard work, but it was also a lot of fun. I have nothing but admiration for all those who work behind the scenes. These are just two of the super ladies I worked with. 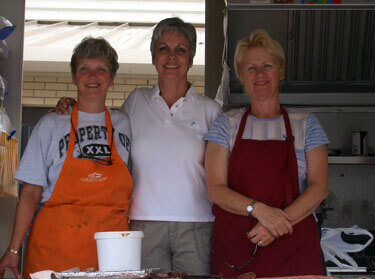 From left to right: Carol Woody, myself and Janice Fortin.